Thanks to the BFI London Film Festival’s decision to broadcast their opening night gala The Imitation Game to various cinemas worldwide, we are proud to bring you a special advance review of the Oscar-contender for all of you lucky people online. 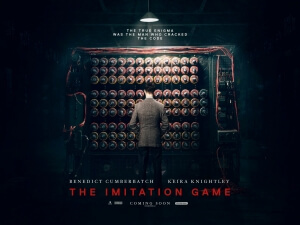 It is only fitting, therefore, that the film be about Alan Turing, the undisputed inventor of the modern age of computing and without whom the Internet would never exist in the first place, and the film has a very grand story to tell regarding this underappreciated icon. The film is poised to be a strong candidate for awards glory over the next few months, and for a good reason. 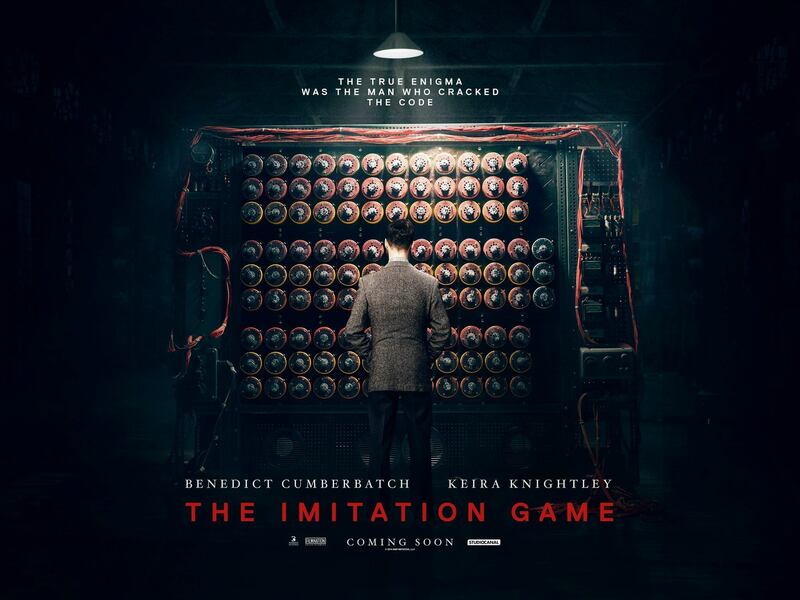 The Imitation Game is an extraordinarily well-made film from its direction – courtesy of Norwegian Headhunters director Morten Tyldum, here making his English-language debut – to its writing – provided by relative newcomer Graham Moore – to, of course, its performances by lead actors Benedict Cumberbatch and Keira Knightley. It’s a film that Turing himself may at the very least have approved of, only because it focuses more on what he actually achieved than the events that led to his public humiliation. The combination of all three elements make for a compelling, moving and surprisingly funny film which, though not without its faults, should be a prime competitor for that precious gold statuette. These faults, if you’re truly curious, are very minor in between. One of them, though admittedly it may be more of a nitpick than a full-blown flaw, is that throughout the film there are various flashbacks or flashforwards to Turing’s time at boarding school and the investigation that led to his arrest for, as they called it back then, “indecency” respectively. While our focus does for the most part remain during the years of the Second World War where Turing and a team of fellow intellectuals attempt to decipher the Enigma code, there are intermittent cuts backs and forth to both these time periods, sometimes very suddenly, and it can be a jarring transition especially if there has been a major development in the main body of the story. A similar fault was also met with last year’s Saving Mr. Banks, which again often cut back to a character’s childhood almost without warning and as such the transition was a little bumpy. However, the flashbacks/forwards in The Imitation Game like with Saving Mr. Banks aren’t terrible and actually prove to be very effective; the only thing we can say against them is, again, the transitions are not as smooth as they’d like to be. There is also an element missing in the story that some people may take umbrage with, and that is Turing’s romantic life in later years. The fact that he was gay, in an era where it was considered a criminal offense or at the very least heavily frowned upon (a theme that spiritually connects it to another great crowd-pleaser, Pride), is definitely addressed in the film but his escapades with other men is more or less glanced over. It may disappoint some who were hoping for a glance into this particular field of his life, but you could make the argument that the real focus of this particular film is not on what made him a national pariah for his sexuality, but rather what he and the other scholars that he led achieved during the War and how it quietly saved around 14 million lives. When you take all that into account, suddenly the fact that he was gay is insignificant in the grander scheme of things – and honestly, do you really care? The film takes a modern approach with its behaviour towards sexuality, by which we mean it shrugs its shoulders and says “Who cares? He’s still an awesome guy. Let’s move on.” A lesser director and writer would have probably played it up a bit more, but Tyldum and Moore bring the right balance to conveying this particular part of his life; quiet and mostly in the shadows, just as Turing himself is depicted in this film. There are many scenes of genuine heartbreak and tension, all made glorious thanks to not only Tyldum’s steady direction and Moore’s witty and intelligent writing, but also the performances of these great performers. Cumberbatch, as you may have suspected, is absolutely marvellous in the role of Alan Turing; in becoming this very complicated and layered man, he makes his character extremely entertaining to watch and likable even in his more narcissistic moments. He definitely plays up the notion of his as-of-date unconfirmed Asperger’s Syndrome, exhibiting all the recognisable mannerisms but still giving us the hint that there is a good, caring person inside. Credit must also be given to young stage actor Alex Lawther, as a younger version of Turing in aforementioned flashbacks, who mimics Cumberbatch’s speech and body patterns to a tee while also exhibiting a performance to call his very own. He is very much a young talent to watch out for in the future, and we’d be very curious to see where he goes next. The rest of the cast, including Knightley as a female addition to the group, all do great jobs in bringing their real-life counterparts to the big screen (though oddly enough, as good as Charles Dance is as a disgruntled officer, he completely disappears from the film after a certain point. Was shooting Dracula Untold really more engaging than returning for more scenes in The Imitation Game? ), but making things even better is that they’re working with a great script, a great director, and the amazing story of an unsung hero who only now, sixty years after his death, is getting the credit he so deserves.